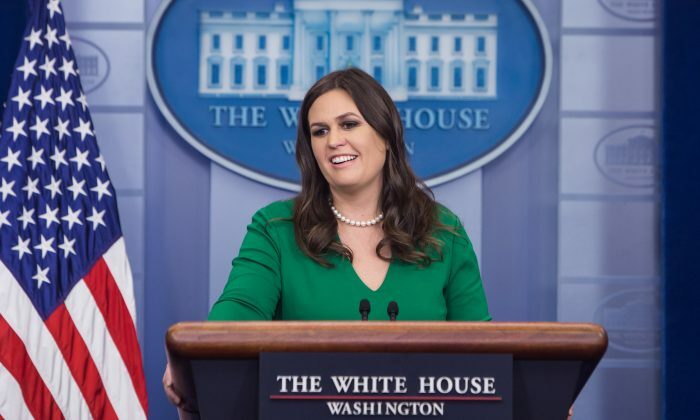 White House Press Secretary Sarah Sanders said on Friday that if there were any collusion with the Russian government, it was by the Clinton Campaign and the Democratic National Committee (DNC). Her comments came after it was revealed that the Clinton campaign and the DNC paid for a dossier on President Donald Trump that used a Russian government official and a Russian spy as sources. The so-called “Trump Dossier” was produced by Fusion GPS and payments to the company were hidden by the Clinton campaign as legal expenses in FEC filings according to The Washington Post. The revelation came after nearly a year of accusations against Trump that he colluded with the Russian government to win the election. However, multiple investigations by Congress and intelligence agencies have found no evidence of such collusion. Former Director of National Intelligence James Clapper, who oversaw a joint-intelligence investigation into the matter, testified under oath before congress on May 8 that no evidence of collusion between the Trump team and Russia had been found. “I think that our position hasn’t changed since day one. And I think we are seeing now that if there was any collusion with Russia it was between the DNC and the Clintons and certainly not our campaign,” Sanders said. The president also weighed in on the matter earlier in the day, writing on Twitter that there had been collusion between Russia and Hillary Clinton. “It is now commonly agreed, after many months of COSTLY looking, that there was NO collusion between Russia and Trump. Was collusion with HC!,” Trump wrote. Two days earlier, Trump said that the Russia conspiracy had turned around. “The hoax has turned around. And you look at what’s happened with Russia, and you look at the uranium deal, and you look at the fake dossier. So that’s all turned around,” Trump told reporters at the White House on Oct. 25. The uranium deal Trump talked about refers to a uranium deal with Russia that the Obama administration approved. The Hill reported on Oct. 17 that Russia had used a sophisticated bribery campaign to secure the nuclear deal. The deal gave Russia control over some 20 percent of America’s mineable uranium deposits. Hillary Clinton, who was serving as Secretary of State at the time, received kickbacks from Russian investors connected to the deal while it was being negotiated. The New York Times reported on April 23, 2015, that the Clinton Foundation received over $10 million in donations from Uranium One and other investors with a stake in the deal. Former President Bill Clinton also received a $500,000 check from a Russian investment bank with links to the Kremlin for a speech he gave in Moscow while the bank was pushing for the deal. The Hill reported that the Obama administration was well aware of Russia using “bribery, kickbacks, extortion, and money laundering” before it signed off on the deal. The FBI, which had uncovered the Russian plot, did not intervene. Instead, then-FBI Director Robert Mueller, flew to Moscow himself in 2009 to provide Russia with a sample of 10 grams of highly enriched uranium. Mueller is now the special counsel investigating the alleged ties between Trump and Russia. The Epoch Times has reported on multiple occasions that no evidence had been found of collusion between Trump and Russia. However, many other media organizations, using unnamed sources, have suggested that such collusion existed. Former FBI Director James Comey explained the problem with the use of anonymous sources during a congressional hearing on June 8. Sanders took a swipe at the media in her statement on Friday. “All of your news organizations have actually spent probably a lot of money on this as well, which we would consider probably a pretty big waste,” she said.